NFL commissioner Roger Goodell wants the catch rule changed so that it actually makes sense. Here's a look at some Super Bowl stories from national media outlets that are making news today. The first time I saw this, I thought it was some kind of subliminal ad for Temple University. It wasn't. But it also wasn't a dumb mistake by a designer. It was fake. The entity that runs the airport confirmed that to MPR. That said, the Vikings are sponsoring a Superb Owl party in Minneapolis that's a neat charity fundraiser. Click here for details. The NFL's catch rule is terrible. This, of course, is not news. You don't even have to be a Steelers fan to agree that Pittsburgh got hosed out of potentially hosting the AFC championship game because a touchdown catch that even the NFL's head of officiating said was a catch ended up not being a catch. NFL commissioner Roger Goodell has gotten an earful about how stupid the catch rule is, and it looks as if he might actually be listening. Speaking on Colin Cowherd's TV show Monday, Goodell said, "You want there to be clarity from an officiating standpoint, a coaching, and a player's standpoint. They know what it is, what it isn't. … [but] it's not the rule that people really want." 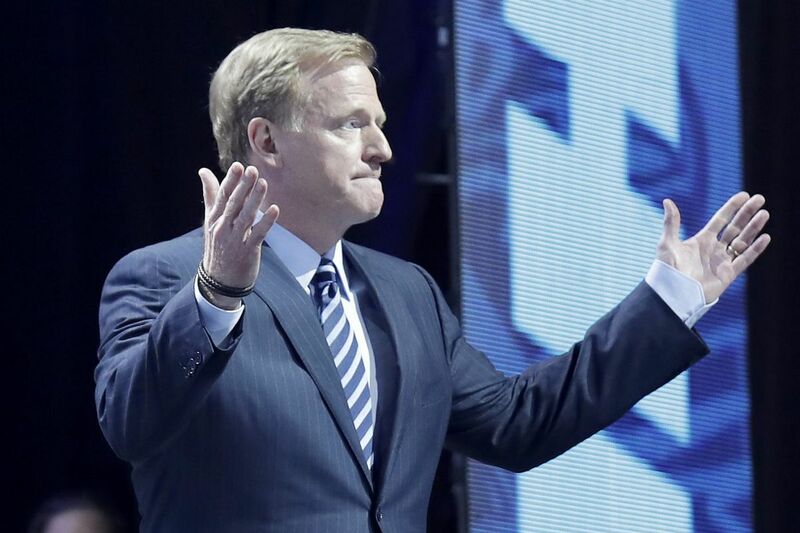 "Fans want catches," Goodell said in a rare moment of bluntness. He added that in the coming offseason, there will be an attempt to change the rule "in a way that will bring more clarity and, frankly, more excitement to this." This one's pretty self-explanatory, and not fake. The average cost of a 30-second ad on this year's Super Bowl TV broadcast is $5 million. AdWeek reported that from the Super Bowl through the Olympics, NBC will bank $1.4 billion in national advertising sales revenue. My colleague Ed Barkowitz is the sports betting expert in our newsroom, so I leave the smart stuff to him. But this one's interesting for reasons beyond the big number in the headline. According to the American Gaming Association, just 3 percent of all wagers placed by Americans on the Super Bowl will be laid down in Las Vegas. It does make you wonder what would happen if sports gambling was legal nationwide, and taxed accordingly. Alex Reimer, the radio host on Boston's WEEI who called Tom Brady's five-year-old daughter "an annoying little pissant," was suspended by WEEI's owner, Entercom (which happens to be based in Philadelphia). Brady was asked about that during Super Bowl media night, and said he doesn't want Reimer to be fired. "I understand criticism is part of sports. But I certainly don't think my children or any other children deserve to be in that," Brady said. "I would hate to have someone have to change their life over something like that."